For those of you not obsessed with football and the Miami Dolphins, you may have missed that last week Stephen Ross (new owner of the Miami Dolphins and Dolphin Stadium) announced a stadium naming deal. 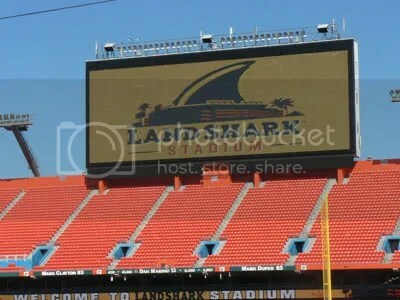 Dolphin Stadium is now Land Shark Stadium. My parents, Rob and I are heading down to Busch Gardens Tampa Africa today to have our last turn at Busch Garden’s Brewmaster Club. About the money thing, yes, it is free beer. You can get two free cups of the beer of your choice inside the Hospitality House AND you can sign up for the Brewmaster Club which allows a sample of four different types of beer. Each sample is about 1/4 of a beer. So that is three free beers for everyone, but not everyone will take full advantage. Also, there are many AB beers that I had never heard of, nor tasted before my Brewmaster Club experience. Some of these I have purchased. For example, I currently have Winter Cask Ale, Stone Mill Pale Ale and a variety of Michelob “craft” beers all BECAUSE I went to the Brewmaster club. I absolutely would NOT have purchased these beers had I not sampled them first. The Busch family wasn’t just giving away free beer, they were giving away a sample as a lure to get you to buy more beer! And it works!